There is no gospel in Islam. The Qur'an clearly contradicts the essence of biblical Christianity and rejects the triune nature of God, disfigures the biblical doctrines of the person of Christ and denies justification through faith on account of the work of Christ on the cross. While claiming to be the perpetual religion of nature and history, following in the footsteps of Christianity, it attempts to justify its claims by asserting that the Word of God, revealed in the New and Old Testament, is corrupted. Our apologetic discussion with Muslims should be to defend the Scriptures and prove that the Scriptures aren’t corrupt as Muslims claim. Our goal is to open up their minds a bit so that they can start reading the Gospels for an eyewitness or a companion of an eyewitness to the real Jesus. Always remember that you are talking to Muslims. Avoid the use of Christian jargon. Speak about real sin, real guilt, real shed blood! Do not be ashamed to use Jesus’ direct and indirect titles clearly such as ‘Son of God’ ‘Lamb of God’ ‘New Adam’ ‘I AM - YAHWEH’ ‘Savior’ ‘Almighty God’. Use tact and be charitable! Don't talk about reprobation with a Muslim or a new convert who has just lost an unbelieving family member. Be kind and courteous! Many Muslims act and speak out of ignorance, not malice. Be sensitive to their past - if they've had a bad experience with Christians, missionaries or churches, struggled with a particular sin etc., be understanding and compassionate! Muslims hate self-righteousness, and rightly so! Do not soft-pedal the law and the guilt of sin, but make sure they understand that you are a justified sinner, not a self-righteous "know it all" who is here to correct them! Muslims will ask you many questions about your faith. Don’t feel like you have to answer all of their questions in one day. However, make sure they hear your answers to one or two questions clearly. Stick with the subject - don't get sidetracked. When the conversation wanders, pull it back to center stage - the law and the gospel. Muslim evangelism is not about winning an argument, but leading Muslims to Christ with the Gospel. Discussions may get heated and intense at times - that's okay. But the purpose of Muslim evangelism is not to show why you are right and Islam is wrong. It is to communicate the truth of the gospel! The message is to be the offence! Not you! When Muslims are apathetic about sin - use the law. When Muslims have doubts or are skeptical - use basic apologetic arguments. When Muslims express guilt for sin - present the Gospel. Evangelism is about leading Muslims to Christ. Convincing non-Christians or Evangelicals that Reformed theology is true, falls under the heading of polemics. Don't confuse the two. Wherever possible, when talking to Muslims speak about Christianity as factually true - "Jesus did this," "Jesus said this," "people heard and saw him," etc. Keep away from the subjective line of approach-- "it works for me," "this is how I feel about it," this is my testimony." Muslims will respect the text you quote, but not your personal opinion. Trust in the power of God the Holy Spirit working through the word! Cite texts directly from the Scriptures with attribution. Jesus says, Paul says.... It will not help Muslims to hear your personal opinion on biblical issues. So, don’t say "I think," or "it seems to me" or "I feel like…" Muslims interpret your thoughts, your take on things or your feelings as part of the corruption of the Bible. Don't rush things with Muslims. Just because a Muslim is not ready to trust in Christ after one encounter does not mean that effective evangelism has not taken place. Pre-evangelism is equally vital. You may plant, but someone else may have to water! Always remember that it is not us who convert the Muslims to Christ but God Himself (in His time)! Don't forget that a prophet is without honor in his own home. The chances of Muslim converts leading their own unbelieving family members (or someone close to them) to Christ by themselves is remote. Encourage them as they give witness to what they have learned, but also pray for God to bring other people into the picture to help evangelize their families. Don't force things. If your Muslim friends balk, ridicule and otherwise are not interested, back off. Find another time and place. If after repeated attempts to communicate the gospel, and someone still shows an unwillingness to hear what you have to say, "shake the dust off your feet and move on to a new town!" Pray for opportunities to evangelize Muslims. Make sure to let your Muslim friends know that you regularly attend a church. Do not disconnect your evangelism effort from the church. Pray for your church - that God would bless the preaching of his word, that he would bring Muslims into our midst, and that he would bless the church with growth. With thanks to our brother "F.B." living in__________. When Christ calls us by his grace we must not only remember what we are, but we must also think of what he can make us into. Note, next, that we are not yet made everything that we will be, nor everything that we should desire to be, when we were first fished for and caught. This is what the grace of God does for us at first; but it is not all. We are like the fishes, making sin to be our element; and the good Lord comes, and with the gospel net he catches us, and he delivers us from the life and love of sin. But he has not done for us all that he can do, nor all that we would wish him to do, when he has done this; for it is another and a greater miracle to make us who were fish to become fishers—to make the saved ones saviors—to make the convert into a converter—the receiver of the gospel into an imparter of that same gospel to other people. I think I can say to every one of you—If you are already saved, then the work is only half done until you are active in bringing others to Christ. You are as yet only half formed into the image of your Lord. You have not attained to the full development of the Christ-like life in you unless you have begun in some feeble way to tell to others of the grace of God: and I trust that you will find no rest to the sole of your foot until you have been the means of leading many to that blessed Savior who is your confidence and your hope. His word is—“Follow me,” not merely that you may be saved, nor even that you may be sanctified; but, “Follow me, and I will make you fishers of men.” Be following Christ with that intent and aim; and fear that you are not perfectly following him, unless in some degree he is making use of you to be fishers of men. The fact is, that every one of us must be about the business of a catching men and women for Christ. If Christ has caught us, we must catch others. If we have been apprehended of him, we must be his sheriffs, to apprehend rebels for him. Let us ask Christ to give us grace to go fishing, and have the ability to cast our nets that we may capture a great multitude of fishes. Oh that the Holy Spirit may raise up from among us some master-fishers, who will sail their boats in many seas, and surround great schools of fish! My teaching at this time will be very simple, but I hope it will be highly practical; for my longing is that none of you, that loves the Lord, would be reluctant to fish for him. May it be that all the members of this church, and all the Christians that hear or read this sermon are fruitful in winning the lost for Christ! The fact is, the day we live in is very dark. The heavens are lowering with heavy thunderclouds. Men often dream of what storms may soon shake this city, and the whole social fabric of this land, even to a general breaking up of society. The night is becoming so dark that the stars may seem to fall like damaged fruit from the tree. The times are evil. Now, if never before, every glow-worm or firefly must show its spark. You with the tiniest candle must take it out from under the bushel, and set it on a candlestick, where it can be seen. We need all of you. Lot was a poor creature. He was a very, very wretched kind of believer; but still, he might have been a great blessing to Sodom had he only pleaded for the people there, as he should have done. And the weak Christians of our day, as I fear many are, need to be prayed for, for we need every one of these truly converted souls, in these evil days—Oh, let us pray that each one of them may glorify the Lord. I pray that every righteous man and woman, irritated as they are with the conversations of the wicked, may be more persistent in prayer than they has ever been, and draw near to their God, and get more spiritual life, that they might be a blessing to the people perishing all around them. I address you, therefore, at this time, first of all to dwell on this thought. Oh, that the Spirit of God may make each one of you feel your personal responsibility! 2. Secondly, something to be done by their great Lord and Master: Jesus said, “…I will make you fishers of men.” You will not grow into fishers by yourselves, but this is what Jesus will do for you if you will just follow him. 3. Lastly, we find a good illustration, from our great Master; for he often spoke to the people with a parable. 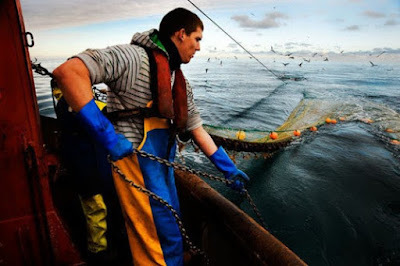 He presents us with an illustration of what Christians should be—fishers of men. We may get some useful hints out of it, and I pray the Holy Spirit to bless them to us. 1. I understand this, first, in this sense: be separated unto Christ. These men were to leave their pursuits; they were to leave their companions; they were, in fact, to quit the world, that their one business might be, in their Master’s name, to be fishers of men. We are not all called to leave our daily business, or to quit our families. That might be rather running away from the fishery than working at it in God’s name. But we are called most distinctly to come out from among the ungodly, and to be separate, and not to touch the unclean thing. We cannot be fishers of men if we remain among men in the same element with them. Fish will not be fishers. The sinner will not convert the sinner. The ungodly man will not convert the ungodly man; and, what is more to the point, the worldly Christian will not convert the world. If you are of the world, no doubt the world will love you as its own; but you cannot save the world. If you walk in darkness, and belong to the kingdom of darkness, you cannot remove the darkness. If you march with the armies of the wicked one, you cannot defeat them. I believe that one reason why the church of the Living God at this present moment has so little influence over the world is because the world has so much influence over the church. Come, you children of God, you must stand with your Lord outside the camp. Jesus calls to you today, and says, “Follow me.” Was Jesus found at the theater? Did he frequent the sporting events or the racetracks? Do you think that Jesus was seen in any of the places of amusement and entertainment of the elite of his day? No, He was not. He was “holy, innocent, undefiled, and separate from sinners.” Yet, in one sense no one mixed with sinners so completely as he did when, like a physician, he went among them healing his patients; but in another sense there was a gulf fixed between the men of the world and the Savior, which he never attempted to cross, and which they could not cross to defile him. 2. A second meaning of our text is very obviously this: live with Christ, and then you will be made fishers of men. These disciples whom Christ called were to come and live with him. They were to be associated with him every day. They were to listen to him publicly teach the eternal gospel, and in addition they were to receive special clarifications, in private, of the Word which he had spoken. They were to be his personal servants and his close friends. They were to watch his miracles and hear his prayers; and, better still, they were to be with him, and become one with him in his holy work. They were allowed to sit at the table with him, and even to have their feet washed by him. Many of them fulfilled that word, “Where you live, I will live:” they were with him in his afflictions and persecutions. They witnessed his secret agonies; they saw his many tears; they noted the passion and the compassion of his soul, and thus, in time, they caught his spirit, and so they learned to be fishers of men. At Jesus’ feet we must learn the art and mystery of soul-winning, to live with Christ is the best education for usefulness. It is a great advantage to any Christian to be associated with a Christian minister whose heart is on fire. The best training for a young man is that which a group of pastors, in the 17th century, gave, in which each elderly pastor had a young man with him who walked with him whenever he went up the mountainside to preach, and lived in the house with him, and listened to his prayers and observed his daily holiness. This was a fine instruction, was it not? But it will not compare with that of the apostles who lived with Jesus himself, and were his daily companions. Unparalleled was the training of the twelve. No wonder that they became what they were with such a heavenly tutor to saturate them with his own spirit! And now today his bodily presence is not among us; but his spiritual power is perhaps more fully known to us than it was to those apostles in those two or three years of the Lord’s earthly presence. There are some of us to whom he is intimately near. We know more about him than we do about our dearest earthly friends. We have never been quite able to totally understand our dearest friend’s heart in all its twists and turns, but we know the heart of the Jesus Christ. We have leaned our head upon his chest, and have enjoyed fellowship with him such as we could not have had with any of our own friends and relatives. This is the surest way of learning how to do good. Live with Jesus, follow Jesus, and he will make you fishers of men. Watch how he does the work, and therefore learn how to do it yourself. A Christian man should be an apprentice to Jesus to learn the trade of a Savior. We can never save men by offering a redemption, for we have none to present; but we can learn how to save men and women by warning them to flee from the wrath to come, and setting before them the one great effective remedy. Watch how Jesus saves, and you will learn how it is done: You cannot learn it any other way. Live in fellowship with Christ, and people will notice that you have a certain demeanor about you, that seems to make you very capable to teach and to win souls. We must not talk about our fellowship with Christ, or our being separated from the world unto him, unless we make him our Master and Lord in everything. Some preachers are not true to all of their convictions, so how can they look for a blessing? A Christian who wants to useful to the Lord, ought to be very particular as to every point of obedience to his Master. I have no doubt whatever that God blesses our churches even when they are somewhat flawed, for his mercy endures forever. When there is a measure of error in the teaching, and a measure of mistake in the practice, he may still consent to use the ministry, for he is very gracious. But a large measure of blessing must necessarily be withheld from all teaching, which is knowingly or glaringly faulty. God can set his seal upon the truth that is in it, but he cannot set his seal upon the error that is in it. Out of mistakes about Christian ordinances and other things, especially errors in heart and spirit, there may come evils, which we never looked for. Such evils may even now be influential on the present age, and may work worse damage on future generations. If we desire as fishers of men to be largely used of God we must copy our Lord Jesus in everything, and obey him in every point. Failure in obedience may lead to failure in success. Each one of us, if he would wish to see his child saved, or his Sunday-School class blessed, or his congregation converted, must be careful that, he is a clean instrument of the Lord. Anything we do that grieves the Spirit of God must take away from us some part of our power for good. The Lord is very gracious and compassionate; but yet he is a jealous God. He is sometimes sternly jealous towards his people who are knowingly neglecting obedience to certain of his commands, or are in associations, which are not clean in his sight. He will hinder their work, weaken their strength, and humble them until they finally say, “My Lord, I will follow you after all. I will do what you call me to do, or else you will not accept me.” The Lord said to his disciples, “Go into all the world and preach the good news to all creation. Whoever believes and is baptized will be saved” [Mark 16:15]. Now, we must get back to apostolic practice and to apostolic teaching: we must lay aside the commandments of men and the impulses of our own brains, and we must do what Christ tells us, as Christ tells us, and because Christ tells us. Definitely and distinctly, we must take the place of servants; and if we will not do that, we cannot expect our Lord to work with us and through us. Let us be determined that, as true as the compass needle is to the north pole, so true will we be, as far as our light goes, to the command of our Lord and Master. 4. Again, I think that there is a great lesson in my text to those who preach their own thoughts instead of preaching the thoughts of Christ. Brothers in Christ, I will have no part of their wickedness. Will you? Our enlightened age believed that they have discovered certain things not taught in the Bible. Evolution may be clearly contrary to the teaching of Genesis, but that doesn’t matter to them. They are not going to be believers of Scripture, but original thinkers. This is the arrogant ambition of the age we live in. Note this, in proportion as the modern theology is preached the depravity of this generation will increase. To a great degree I attribute the looseness of our age to the carelessness of the doctrine preached by its teachers. From the pulpit they have taught the people that sin is a small thing. From the pulpit these traitors to God and to his Christ have taught the people that there is no hell to be feared. A little, little hell, perhaps, there may be; but justified punishment for sin is made nothing of. The precious atoning sacrifice of Christ has been derided and misrepresented by those who were pledged to preach it. They have given the people the name of the gospel, but the gospel itself has evaporated in their hands. From hundreds of pulpits the gospel has disappeared; and still the preachers take the position and name of Christ’s ministers. Well, and what comes of it? Why, their congregations grow thinner and thinner; and so it must be. Jesus says, “Follow me, I will make you fishers of men;” but if you go your own way, with your own net, you will make nothing of it, and the Lord promises you no help in it. The Lord’s directions makes himself our leader and example. It is, “Follow me,follow me. Preach my gospel. Preach what I preached. Teach what I taught, and keep to that.” Do this, and he will make you fishers of men; but if you do not do this, you will fish in vain. 5. I close this part of my discourse by saying that we will not be fishers of men unless we follow Christ in one other respect; and that is, by endeavoring, in all points, to imitate his holiness. Holiness is the greatest real power that can be possessed by men or women. We may preach the truth, but we must also live the truth. God forbid that we should preach anything else; but it will be all in vain, unless there is a life at the back of the testimony. An unholy preacher may even render truth contemptible. In proportion as any of us draw back from a living a zealous sanctification we will draw back from the place of power. Our power lies in this word, “Follow me.” Be like Jesus. 1. When his dear servants are following him, he says, “I will make you fishers of men;” and be it never forgotten that it is he that makes us follow him; so that if the following of Christ be the step to being made a fisher of men, yet this he gives us. ‘It is all of his Spirit. I have talked about catching his spirit, and abiding in him, and obeying him, and listening to him, and copying him; but none of these things are we capable of apart from his working them all in us. “…your fruitfulness comes from me” [Hosea 14:8], is a text which we must not for a moment forget. So, then, if we do follow him, it is he that makes us follow him; and so he makes us fishers of men. 2. But, further, if we follow Christ he will make us fishers of men by all our experience. I am sure that the man who is really consecrated to bless others will be helped in this by all that he feels, especially by his afflictions. I often feel very grateful to God that I have undergone fearful depression of spirits. 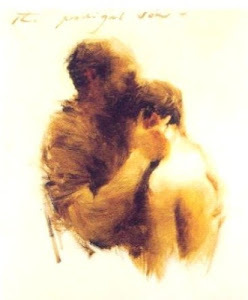 I know the borders of despair, and the horrible brink of that gulf of darkness into which my feet have almost gone; but hundreds of times I have been able to give a helpful grip to brethren and sisters who have come into that same condition, which grip I could never have given if I had not known their deep despondency. So I believe that the darkest and most dreadful experience of a child of God will help him to be a fisher of men if he will but follow Christ. Keep close to your Lord and he will make every step a blessing to you. If God in providence should make you rich, he will allow you to speak to those ignorant and wicked rich who so much abound in this city, and so often are the cause of its worst sin. And if the Lord is pleased to let you be very poor you can go down and talk to those wicked and ignorant poor people who so often are the cause of sin in this city, and so greatly need the gospel. The winds of providence will move you to where you can fish for men and women. The wheels of providence are full of eyes, and all those eyes will look this way to help us to be winners of souls. You will often be surprised to find how God has been in a house that you visit: before you get there, his hand has been at work in its rooms. When you wish to speak to some particular individual, God’s providence has been dealing with that individual to make him ready for just that word which you could say, but which nobody else but you could say. Oh, be you following Christ, and you will find that he will, by every experience through which you are passing, make you fishers of men. 3. Further than that, if you will follow him he will make you fishers of men by distinct warnings of impending dangers in your own heart. The Holy Spirit warns us of many impending dangers, which are not noticed by Christians when they are in an indifferent condition; but when the heart is right with God and living in communion with God, we feel a sacred sensitivity, so that we do not need the Lord to shout, but his faintest whisper is heard. No, he doesn’t even have to whisper, and yet we hear Him. Oh, how many willful Christians there are who must be controlled tightly with the bit and bridle, and receive a lash of the whip every now and then! But the Christian who follows his Lord will be tenderly guided. I do not say that the Spirit of God will say to you, “Go to that chariot,” or that you will hear a word in your ear; but yet in your soul, as distinctly as the Holy Spirit said to Philip, “Go to that chariot and stay near it” [Acts 8:29], you will hear the Lord’s will. As soon as you see an individual, the thought will cross your mind, “Go and speak to that person.” Every opportunity of usefulness will be a call to you. If you are ready, the door will open before you, and you will hear a voice behind you saying, “This is the way; walk in it.” If you have the grace to run in the right way you will never be long without an inkling as to what the right way is. That right way will lead you to river or sea, where you can cast your net, and be a fisher of men. 4. Then, too, I believe that the Lord meant by this that he would give his followers the Holy Spirit. You men and women that sit before me today, you are sitting by the shore of a great sea of human life swarming with the souls of men and women. You live in the midst of millions; but if you will follow Jesus, and be faithful to him, and true to him, and do what he commands you to do, he will make you fishers of men. You are not fit for such a task, but he will make you fit. You cannot do it by yourselves, but he will make you do it. You do not know how to spread the nets and draw schools of fish to shore, but he will teach you. Only follow him, and he will make you fishers of men. I wish that I could somehow say this as with a voice of thunder, that the whole church of God on earth might hear it. I wish I could write it in stars diagonally across the sky, “Jesus said, Follow me, and I will make you fishers of men.” If you forget the edict, the promise will never be yours. If you follow some other track, or imitate some other leader, you will fish in vain. God grant us to believe fully that Jesus can do great things in us, and then do great things by us for the good of all those around us! III. The last point you might study in your private meditations with much benefit. We have here AN ILLUSTRATION FULL OF INSTRUCTION. I will give you a few thoughts which you can use. “I will make you fishers of men.” You have been fishers of fish: if you follow me, I will make you fishers of men. 1. A fisher is a person who is very dependent, and needs to have faith. He cannot see the fish. One who fishes in the sea must go and throw in the net, as it were, at an uncertain possibility. Fishing is an act of faith. I have often seen in the Mediterranean men go with their boats and enclose acres of sea with vast nets; and yet, when they have drawn the net to shore, they have not had even a whole handful of fish. A few wretched silvery nothings have made up the whole catch. Yet they have gone again and thrown the great net several times a day, hopefully expecting something to come of it. Nobody is so dependent upon God as a minister of God. Oh, this fishing from the Church’s pulpit! What a work of faith! I cannot tell that a soul will be brought to God by it. I cannot judge whether my sermon will be suitable to the persons who are here, except that I do believe that God will guide me in the throwing of the net. I expect him to work salvation, and I depend upon him for it. I love this complete dependence, and if I could be offered a certain amount of preaching power, by which I could save sinners, which should be entirely at my own disposal, I would beg the Lord not to let me have it, for it is far more delightful to be entirely dependent upon him at all times. It is a blessed thing to be weak if Christ becomes more fully your strength. Go to work, you who would be fishers of men, and yet feel your insufficiency. You that have no strength, attempt this divine work. Your Master’s strength will be seen when your own strength is gone. A fisherman is a dependent person, he must look up for success every time he puts the net down; but still he is a person of faith, and therefore he throws in the net joyfully. 2. A fisherman who makes his living by fishing is a diligent and persevering man. The fishers are up at dawn. At daybreak our fishermen are fishing, and they continue fishing till late in the afternoon. As long as hands can work men will fish. May the Lord Jesus make us hard working, persevering, unwearied fishers of men! “Sow your seed in the morning, and at evening time do not let your hands be idle, for you do not know which will succeed, whether this or that…” [Ecclesiastes 11:6]. 3. The skillful fisherman is intelligent and watchful. It looks very easy, I dare say, to be a fisherman, but you would find that it was no child’s play if you were to take a real part in it. There is an art in it, from the mending of the net right on to the pulling it to shore. How diligent the fisherman must be to prevent the fish from leaping out of the net! I heard a great noise one night in the sea, as if a giant was beating some huge drum; and I looked out, and I saw that the fishermen were beating the water to drive the fish into the net, or to keep them from leaping out of it, while the net was being closed around them. Ah, yes! And you and I will often have to be watching the corners of the gospel net lest sinners who are almost caught should make their escape. They are very crafty, these fish, and they use this craftiness in endeavoring to avoid salvation. We will have to be always at our business, and to exercise all our faculties, and more than our own intellects, if we are to be successful fishers of men. 4. The fisherman is a very hard working person. Being a fisherman is not an easy calling. He does not sit in an armchair and catch fish. He often has to go out in harsh weather. If a farmer worries about the clouds he will never sow, likewise, a fisherman that worries about the clouds will never fish. If we never do any work for Christ except when we feel up to it, then we will not do much. If we feel that we will not pray because we cannot pray, we will never pray, and if we say, “I will not preach today because I do not feel that I could preach,” we will never preach any preaching that is worth the preaching. We must be always at it, until we wear ourselves out, throwing our whole soul into the work in all circumstances, for Christ’s sake. 5. The fisherman is a daring man. 6. Now, in the last place, the man whom Christ makes a fisher of men is successful. “But,” one says, “I have always heard that Christ’s ministers are to be faithful, but that they cannot be sure of being successful.” Yes, I have heard that saying too, and in one way I know it is true, but in another way I have my doubts about it. He that is faithful is, in God’s way and in God’s judgment, more or less successful. For instance, here is a brother who says that he is faithful. Of course, I must believe him, yet I never heard of a sinner being saved under his ministry. Indeed, I would think that the safest place for a person to be in if he did not want to be saved would be under this gentleman’s ministry, because he does not preach anything that is likely to arouse, impress, or convince anybody. This brother is “faithful:” so he says. So likewise, if any person in the world said to you, “I am a fisherman, but I have never caught anything,” you would wonder how he could be called a fisherman. A farmer who never grew any wheat, or any other crop—is he a farmer? When Jesus Christ says, “Follow me, and I will make you fishers of men,” he means, that you will, really catch men and women—that you really, will save some; for he that never did catch any fish is not a fisherman. He that never saved a sinner after years of work is not a minister of Christ. If the result of his life work is nothing, he made a mistake when he undertook it. Go with the fire of God in your hand and fling it among the straw, and the straw will burn. You can be sure of that. Go and scatter the good seed: it may not all fall in fertile places, but some of it will. You can be sure of that. Go and let your light shine, and someone’s eye will se the light. You must, you will succeed. But remember this is the Lord’s word—”Follow me, and I will make you fishers of men.” Keep close to Jesus, and do as Jesus did, in his spirit, and he will make you fishers of men. Perhaps I speak to an attentive hearer who is not converted at all. Friend, I have the same thing to say to you. You may also follow Christ, and then he can use you, even you. I don’t know but that he has brought you to this place that you may be saved, and that in years to come he may make you speak for his name and glory. Remember how he called Saul of Tarsus, and made him the apostle to the Gentiles. Recovered poachers make the best gamekeepers; and saved sinners make the most capable preachers. Oh, that you would run away from your old master, Satan, tonight, without giving him a minute’s notice; for if you give him any notice, he will hold on to you. Rush to Jesus, and say, “Here I am a poor runaway slave! My Lord, I bear the shackles still upon my wrists. Will you set me free, and make me your own?” Remember, it is written, “…whoever comes to me I will never drive away” [John 6:37]. Never did a runaway slave come to Christ in the middle of the night without Jesus taking him in; and he never gave one up back to his old master. If Jesus makes you free you will be free indeed. Quickly flee to Jesus. May the Holy Spirit help you, and he will in time make you a winner of others to his praise! God bless you. Amen.